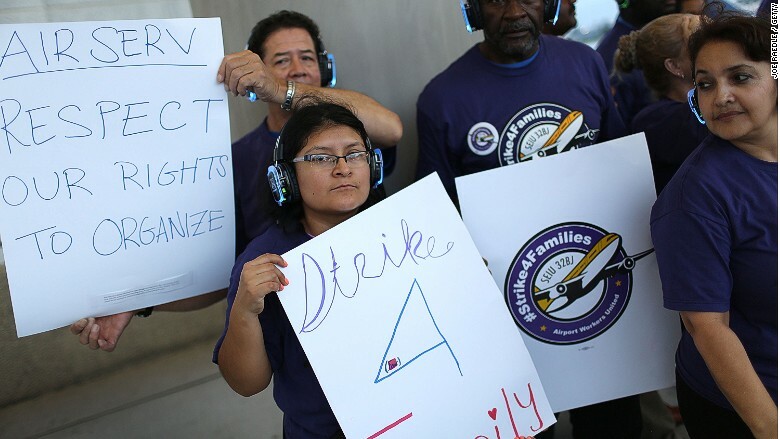 Airport workers demanding $15 an hour have gone on strike at seven major airports in the U.S. The workers, mostly cabin and airport cleaners, were picketing Thursday morning at John F. Kennedy and LaGuardia airports in New York City, as well as airports in Newark, N.J., Boston, Philadelphia, Chicago and Fort Lauderdale, Fl., according to the Service Employees International Union. The SEIU tweeted videos of workers picketing outside terminals at JFK, Newark, and Philadelphia airports. At Chicago's O'Hare airport, more than 14 security workers joined the strike against unfair labor conditions. The employees are not affiliated with TSA -- they're subcontracted through a company called Universal Security. O'Hare said it knew of the strike in advance and both the airport and Universal Security said operations wouldn't be affected. At JetBlue's Terminal 5 at JFK, the workers brandished signs saying "on strike over unfair labor practices" with the old TWA terminal visible in the background. The strike was expected to involve thousands of workers, but it was not immediately clear how many were striking. The union organizing the strikes, the SEIU, said Thursday morning that it was too soon to know what kind of effect the work stoppage was having on airport operations. The workers are subcontracted by outside companies to work with various airlines, including JetBlue (JBLU), Delta (DAL) and United (UAL). They're striking for new contracts, which include medical benefits and hourly wages of $15 an hour. In Fort Lauderdale, cabin and airport cleaners were to be joined by baggage handlers, ramp workers, wheelchair attendants, and janitors. 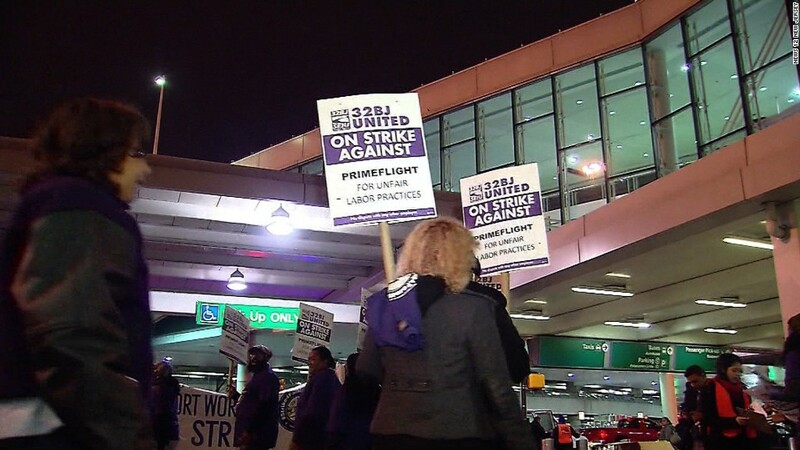 Picket lines started forming Wednesday outside airport terminals. "We did not see an impact to our normal operations," said a spokesman for United. "We are ensuring our vendors have contingency plans in place to continue to serve our customers." A JetBlue spokesperson said, "We are working with our business partners to ensure staffing is in place so that operations are not disrupted." A spokeswoman for Delta said the airline "will rely on its employees and partners to ensure normal operations for customers booked through LaGuardia Airport." The head of the New York-New Jersey Port Authority, which runs the New York City airports, demanded last year that airport workers' wages be raised to $10.10 an hour. But workers insist that isn't enough. Striking cabin and airport cleaners at both JFK and LaGuardia airports are protesting their employers Roma and Ultimate Aircraft, which are subcontracted by JetBlue, and Gate Serve, which is subcontracted by Delta. One cabin cleaner who was ready to strike is 41-year-old Jean Timmer. He began working for Ultimate Aircraft in September and told CNNMoney he makes $10.10 an hour working the overnight shift. "It's not enough to support our families," he said. Timmer, who has one daughter, stressed the importance of earning a living wage and securing medical benefits. "Safety concerns are a really big deal, and if we get injured who's going to pay for that -- we are," Timmer said. He said he chose to work at JFK because there are a lot of opportunities for advancement, but stressed that current working conditions were unbearable. "We're not getting our fair share," Timmer said. "These companies can't function without workers and yet they don't want to treat us fairly." --CNNMoney's Rob Mclean and Jackie Wattles contributed to this report.